Midwest City, Ok. — Linen King’s Midwest City healthcare laundry facility has received accreditation from the Healthcare Laundry Accreditation Council (HLAC), the industry’s highest rating on quality and safety. This recent recognition will mark Linen King’s third HLAC Accreditation. HLAC affirms that Linen King has successfully passed an inspection of the following: its facility, policies and procedures, training programs, and its relationships with its healthcare customers. Linen King is currently in the process of scheduling certification inspections for its remaining locations and plans to complete the process in 2016 as HLAC inspectors are available. 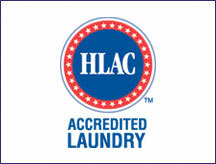 HLAC is a non-profit, independent organization that inspects and accredits laundries processing textiles for hospitals, nursing homes and other healthcare facilities. Its mission is to publish high standards for processing healthcare textiles in laundries, and to accredit laundries that meet those standards. A national, independent inspection process assures customers that the highest quality and safety standards are met. Founded in 1999, Linen King provides customized laundry care solutions for its clients. Linen King primarily serves the healthcare laundry sector, choosing to focus on large, acute-care health systems. Linen King processes more than 50 million pounds of textile products annually for hospitals and medical facilities from its five locations throughout Oklahoma, Arkansas, Missouri and Kansas. For more information about Linen King visit www.thelinenking.com.